We provide a variety from the well-loved wedding repertoires to classical music and pop tunes. Yes Song requests are possible if informed in advance. Extra charges may apply for music sheets arrangements. We have white and black formal attire available on request. 50% down payment to confirm your booking, 50% remaining balance to be paid within the event / wedding week. 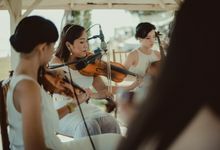 Bali Wedding and Event Music - Exclusive Arrangements of Modern and Classical Music. 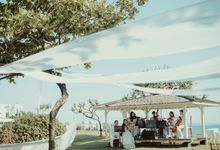 A group of experienced musicians who actively perform at various events in Bali. 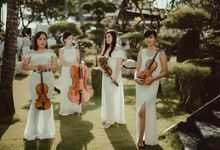 We provide contemporary and classical string solo, duo, trio or quartet to cater your needs. Bigger format quintet to double quartets are also available upon request. ​ Create a perfect ambience and add elegance to any of your events.